Today, right now, you get an actual picture on this blog! The point of this picture is my outfit. I think I look a bit gross actually, but I always think that about myself, except when my hair and face are did. In this picture they are not. I just thought this was a cool outfit that I managed to put together. Aren’t I smart? So I have on my pleather skirt, which I found at The Warehouse about a year ago. My new floral top from Pagani. 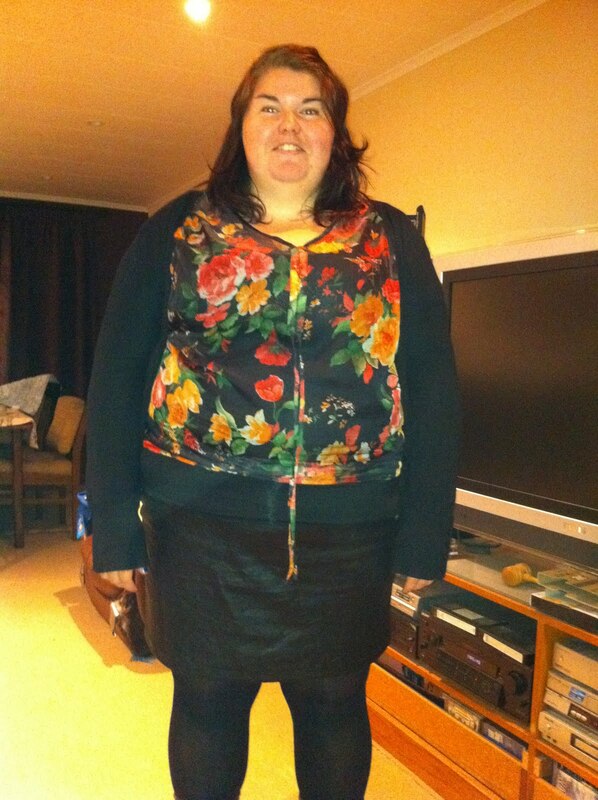 Black singlet underneath, black pantyhose – pretty plus, they are awesome and actually stay up and black cardy. I think it works. I love getting new pieces that end up going well with old pieces. Yay! Here is another picture of me where I’m all made up. 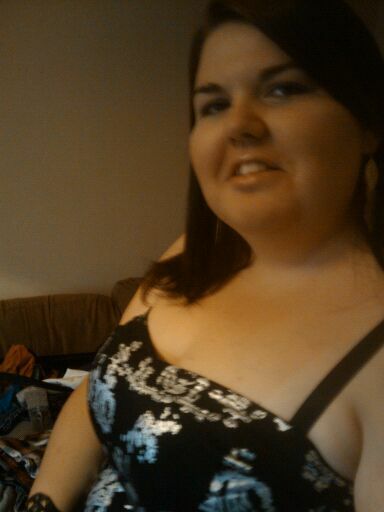 I have been told I was looking hawt that night. I’m wearing my new City Chic dress. I love it so much. If I could wear it everyday, I would. Except I don’t think it is exactly appropriate for everyday wear. I don’t even know if I could get away with it at work. Lastly, a pair of shoes! These are my peep-toe heel-boots. They stop at the ankle, but are very boot like. Have a gold zip as the trim and are ridiculously comfortable. I don’t imagine ever getting a blister in these. 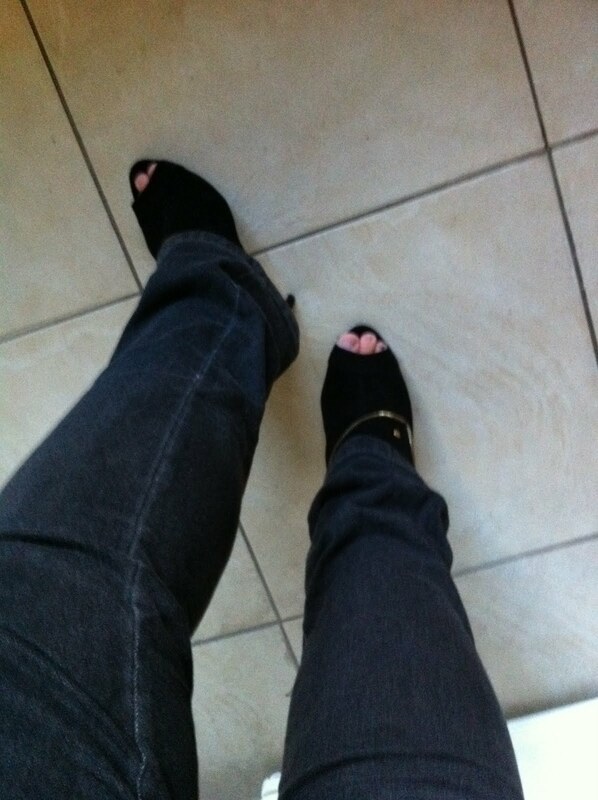 I had them on, because I wanted to try and get used to them, or just get used to heels in general. So I was baking the lemon meringue cupcakes, while wearing heels. I’m totally awesome. But after about an hour-and-a-half of standing and kind of walking round the kitchen my feet were starting to get a bit sore. I could have definitely kept wearing them. But going for that long without sitting down can be a bit painful. So off they came. The jeans I am wearing are the ones I rediscovered yesterday that don’t do up, but make my legs look awesome.